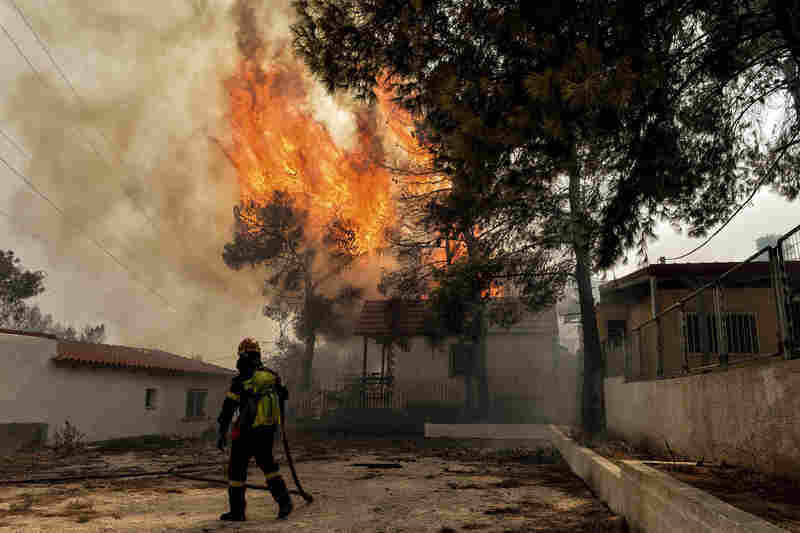 'A Terrible Day': Greek Wildfires Kill At Least 74 People, Devastate Resort Village The death toll from surprisingly fast-moving fires near Athens has tripled from Monday. Officials in Greece said they found 26 bodies in one spot. Flames rise as a wildfire burns in the town of Rafina, near Athens, on Monday. 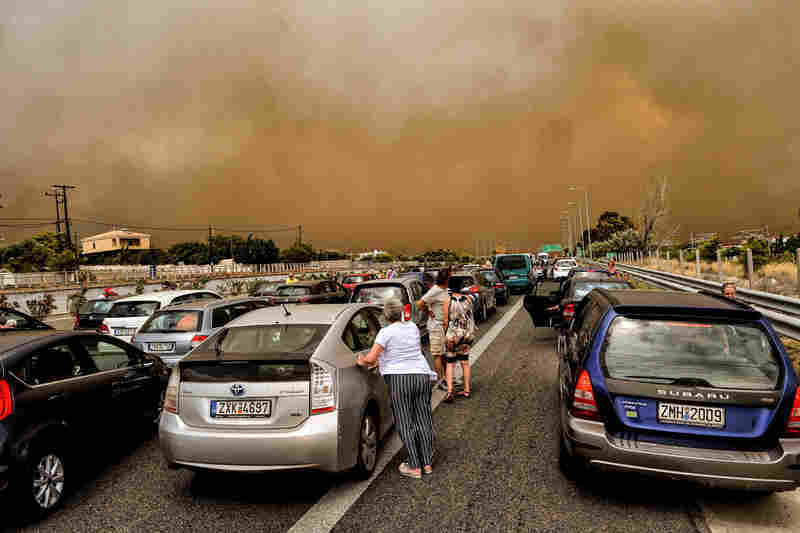 Cars are blocked at the closed National Road as a wildfire rages in Kineta, west of Athens. A huge blaze threatens a house in Kineta. A woman sprays water outside her house, which was damaged by wildfires near the village of Neos Voutzas, on Tuesday. A firefighting truck drives through a haze of smoke as a wildfire burns Monday in Kineta. 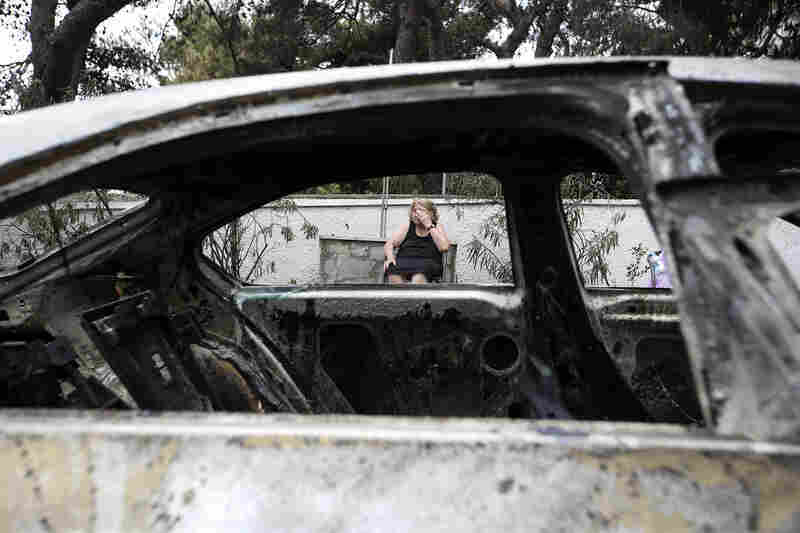 Asimina Psalti, 87, sits outside her burned house in the resort village of Mati on Tuesday. 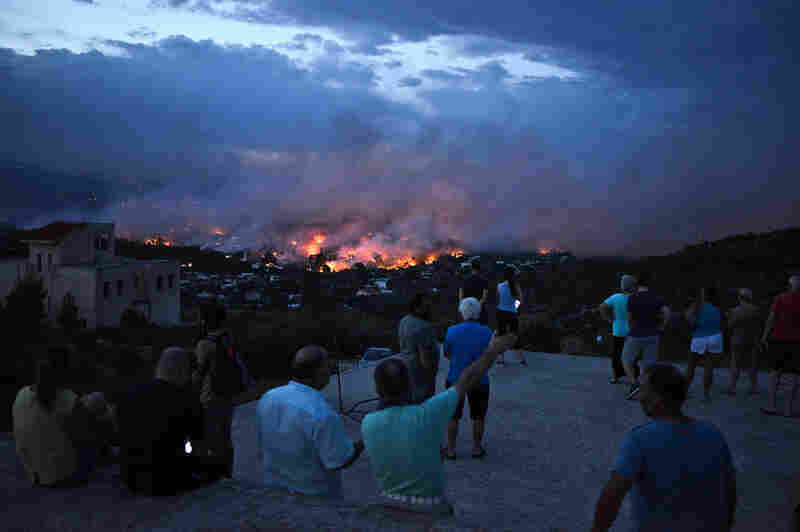 People watch a wildfire in the town of Rafina on Monday. 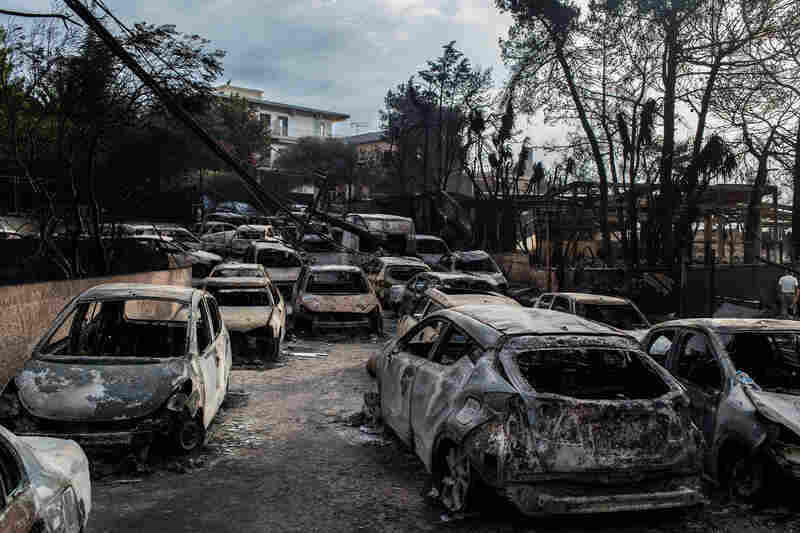 Charred cars lined a roadway in the village of Mati, about 15 miles east of Athens, on Tuesday. A firefighter attempts to put out flames coming from a building. 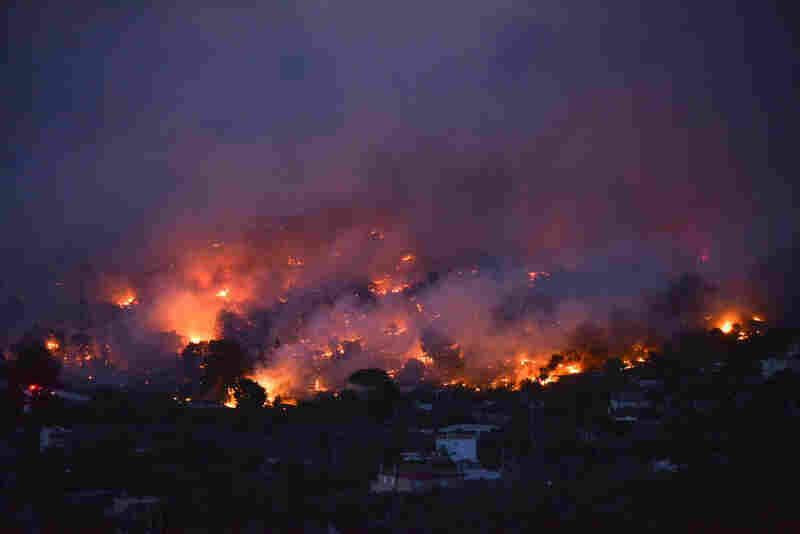 A major fire broke out in the Penteli area northeast of Athens. Local authorities said they were evacuating children's summer camps, while dozens of homes and cars were reportedly destroyed. A firefighter tries to extinguish hotspots during a wildfire in Kineta on Monday. 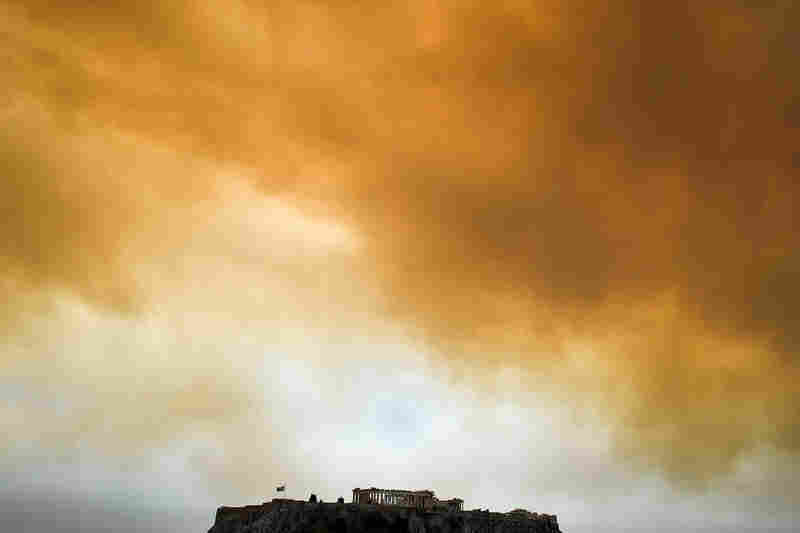 A picture taken Monday shows the Parthenon temple on the Acropolis hill in Athens as smoke from a wildfire in Kineta billows in the background. Rescue workers warn the death toll is likely to rise, as they go through the scorched remains of hundreds of homes and cars. In addition to those killed, 164 adults and 23 children were injured, according to the fire service. The danger has not let up: From 6 a.m. to 6 p.m. Tuesday, officials said, firefighters were called to face 18 forest fires. Early Tuesday, the Hellenic Red Cross workers made the gruesome discovery of 26 bodies near the badly burned resort village of Mati, in the Rafina area east of Athens. It's a popular vacation spot for older Greeks and for kids attending summer camps. "What a terrible day," Nikos Economopoulos, the nation's Red Cross director, told state TV. NPR went to the the village of Mati, now largely evacuated. The charred remains of homes still smoldered. Sooty heaps of scorched cars lined the street. Architect Yiannis Orphanos inspected his charred home not far from the spot where the 26 bodies were found. Rescue workers told him about the victims. "They were surrounded by thick smoke and were trying to make their way to the beach," Orphanos told NPR. "But because of the smoke, they must have found it hard to orient themselves. They never made it to the beach. The smoke overwhelmed them." He said he can't stop thinking about them. "The fact that they were hugging," he said, shaking his head, "hugging as the smoke overwhelmed them." He hugged his own son. "We are lucky," he said. A friend had been staying at Orphanos' house and had fled immediately with her dogs as soon as she saw huge plumes of smoke. "A good thing, because look what happened," Orphanos said. Among the first to flee Mati were some 50 residents and the staff of a foundation run by a monastery. They included monks, nuns, retirees in a monastery-run rest home and 10 teenage orphans, according to Panos Tzilavis, who runs the the Marathon Beach Resort in Nea Makri. Tzilavis got a call that the group needed a place to stay, and he took them in for free. "They arrived exhausted and stressed in the middle of the night," he said. "They spoke about how they left as soon as they saw the flames. They were afraid they'd burn up." Tzilavis said he is trying to make the group feel as comfortable as possible. Every few hours, locals dropped off food, juice, clothes and shampoo for them. NPR asked to speak to the survivors, who were all in hotel rooms, but a representative of the Greek Orthodox Church forbade them to speak. 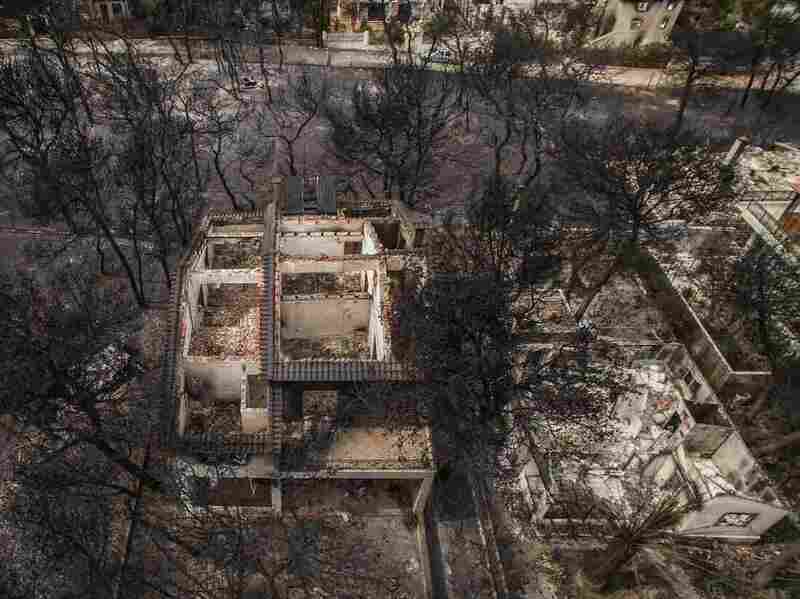 The U.S. Embassy in Athens — which issued alerts about the dangerous fires on Monday afternoon — said American fire experts are visiting Greece to meet with officials to discuss how U.S. agencies can help. Wildfires left behind burned-out shells of homes in the village of Mati, near Athens. Greek Red Cross workers discovered 26 bodies in the devastated resort village. 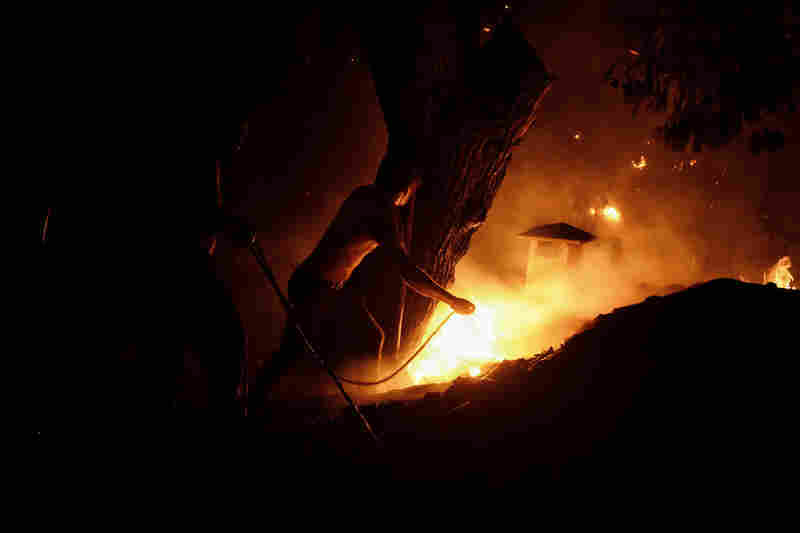 Greek firefighters battled the flames throughout the night. 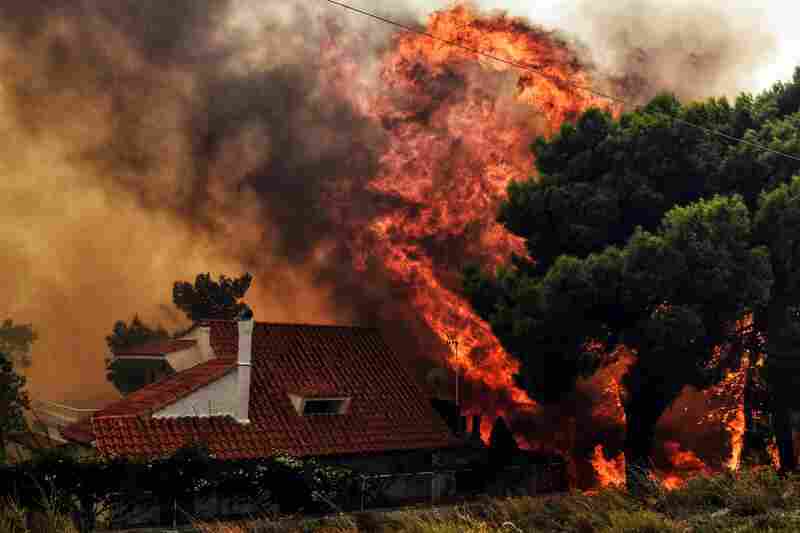 The worst fire broke out east of Athens near the town of Rafina. Other fires raged west of Athens in Kineta and to the north, around the towns of Pendeli and Kalamos. Tsipras cut short his visit to neighboring Bosnia on Monday and quickly returned to Athens. He told reporters that his government will do "whatever is humanly possible to control" the fires. 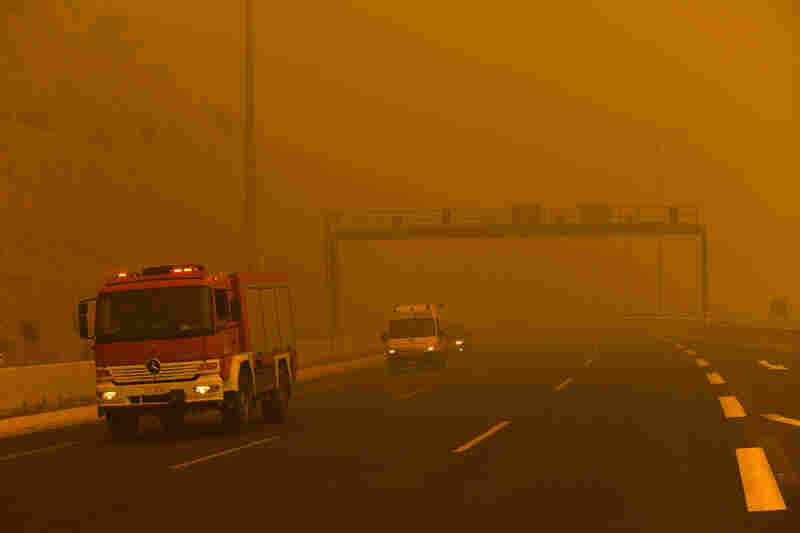 Wildfires are not unusual during Greece's hot, dry summers. Dozens of people died during an especially fiery summer in 2007. But Monday's blazes near Athens spread so quickly that they seemed to catch everyone off guard. In the towns of Penteli and Rafina, northeast of Athens, children were evacuated from summer camps. Skai TV news reported that residents and vacationers fled to nearby beaches in Rafina, where they were rescued by the coast guard. Ten panicked tourists, reportedly from Denmark, also fled a beach by boat. Five have been located and rescued. At least three villages have been evacuated. 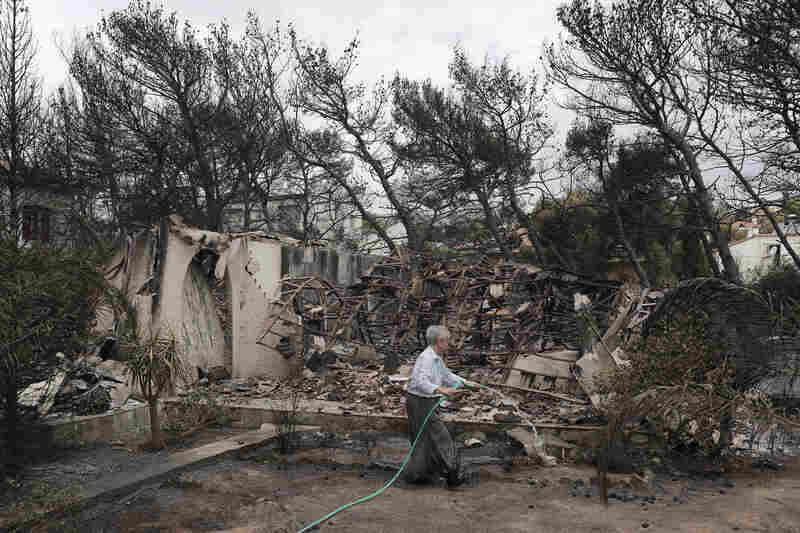 Evangelos Bournous, the mayor of the seaside town of Rafina, told reporters that he has seen many homes go up in flames.